The GCD Project Report command is a new feature in GCD 6 and is undergoing development. 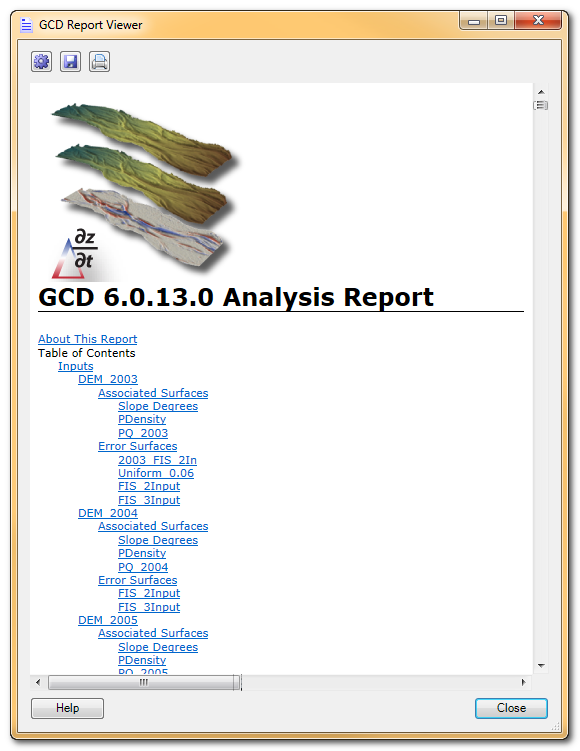 A basic report is created from a combination of the Project information, screen-shots of the different map layers, tabular and graphical outputs of the GCD. The report is an on demand Geomorphic Change Detection (GCD) analysis report. 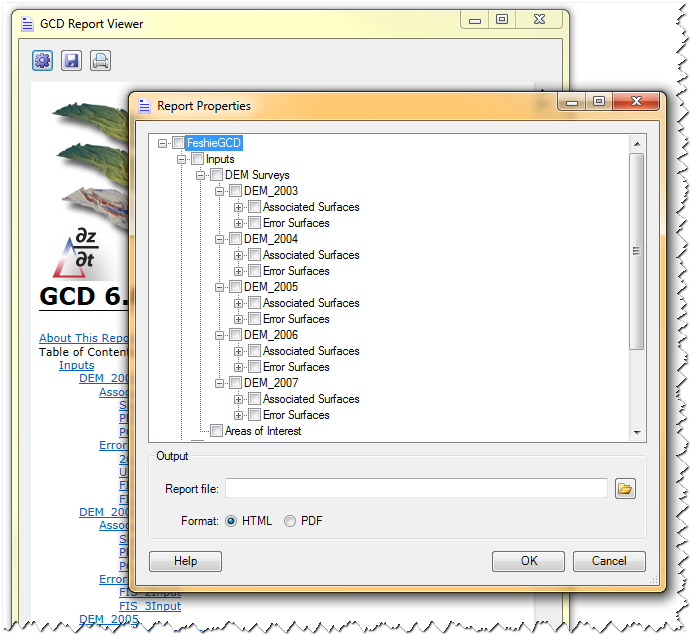 The report is user generated at either the GCD 6 software ArcGIS toolbar menu, or as part of a command line GCD analysis. The report has not been edited, and is not intended to provide background or context for the project itself nor to provide interpretations of results or summary findings. The report instead provides a consistent reporting of the inputs and analyses performed with GCD and the methods the user used within GCD to prepare those inputs and run analyses. User preparation of inputs prior to loading them in the GCD are not reported here, nor are subsequent analyses and interpretations made outside of GCD, but based on GCD outputs. The report is interactive and dynamic and provides a transparent accounting of the data inputs, processing options and outputs generated during a particular run of the GCD software. The report helps users and reviewers of analyses determine whether error analyses, uncertainty accounting and change detection techniques were followed correctly. The report helps to determine whether reported values fall within acceptable ranges and tolerance limits, and helps troubleshoot where within the workflow errors may have been introduced. Consequently, the metadata contained in the report can significantly streamline the topographic survey and change detection QA/QC process and will assist the user in their own synthesis and interpretation of GCD results. It also aides in helping users reproduce their results. Eventually, you will be able to customize the report using a tree similar to the project explorer to include only the portions of the GCD project you want to. You will also be able to export the report as a PDF, Word Document or HTML. We welcome feedback on the report. Look for regular feature updates in subsequent releases.